Welcome to the 2013 VRC Worlds at Messina Italy. The is the last big event for this class this year and as it is a top level event (5) there are maximum points to be earned for your rankings! The track plus a selection of generic components have been set free for the duration of this event so you can join absolutely FREE! Body: ALL BRANDS make sure to select an nice paintscheme and your favorite brand decals for this race!!! The free track and components will be changed back to the normal paid state on Friday December 13, so an absolutely free ride until then! In Pro Nations ranking Germany took first spot with a strong 4th place finish of Lehmann and 5 cars in the top-23. Austria took 2nd spot with Ingo Graf making the A-Main to finish 10th, and their best 5 in the top-41. Italy had to settle for 3rd despite the World Championship title of Kevin Pignotti, the rest of the Italian team couldn’t deliver this time. A total of 83 racers competed in Pro class this year. Check out the exiting video of the A-Main, with commentary by Mike Garrison of LiveRC. This A-Main was very much a 2-horse race between Gregory Santens from France and Marcel Schmidt from Germany. Up until lap 90 there was never more than 6 seconds between these 2 rivals but as it turned out, they were on a different tire strategy for the 45 minute final. Santens had opted to change tires mid race and with just 4 seconds between them at that time Schmidt was able to pull a 10 second gap on Santens. Between lap 120 and 142 they fought a fierce battle for the lead but towards the end it was obvious that the better tires of Santens would give him victory if he would be able to stay out of trouble, which he did. 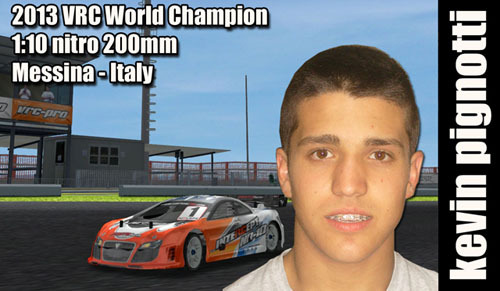 In the end Santens had stretched the lead to some 6 seconds over Marcel Schmidt, a deserved winner in Sports. Rauno Lainemae from Estonia had to settle for 3rd 2 laps down on the winner. Germany also took first spot in Sport Nations ranking with France in 2nd and Austria in 3rd. 80 Racers participated in Sport class. With 209 racers this was the biggest class in 1:10 200mm nitro. At the start signal Jeremy Alexandre from Canada drove away from the field and never looked back to finish with a comfortable 2 lap lead over runner up Lorenzo Crolla from Italy. The fight for second between Crolla and Aaron Lee from Australia was a lot closer. Lee had opted for a very early tire change in lap 73 while he was in 2nd place, this gave Crolla a chance to jump to second with about a 16 seconds lead on Lee. Crolla took the lead in lap 95 during Alexandre’s tire change but had to give it back to him in lap 112 when he had to come in for tires and fuel as well. Lee was able to pass him and was 0.6 seconds ahead of Crolla when he came out of the pit lane. In lap 145 he was able to pass the Aussie to go back to second and was able to hold on to it till the end to finish with a 10 sec cushion over Lee. Aaron Lee’s 3rd place and Alex Koussas 4th place in the A-Main lead Australia to victory in the Club Nations ranking , with France taking second and Spain taking 3rd. Auguri Kevin, sei il migliore.. Very nice commentator and congratulations to Kevin. What an Amazing Commentator!!! Fun,.. I LIKE IT!!!! Kevin sei un mostro, tutta la mia stima!